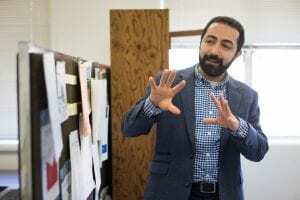 San Jose State University Associate Professor of Physics and Astronomy Ehsan Khatami in collaboration with a group of professors from MIT and the MIT-Harvard Center for Ultracold Atoms published today in the journal Science their latest experimental discovery about conduction in a tiny system of atoms in a vacuum. Khatami, who was granted early tenure and promotion to associate professor this year, received a funding from the National Science Foundation with colleague Sen Chiao, of the Meteorology Department to build the first high-performance computing cluster on campus. The equipment has proven essential to his research as well as the work of students and faculty in other disciplines that require big data analysis. In his most recent article, Khatami and his colleagues discuss an experiment that is impossible to perform using real materials. 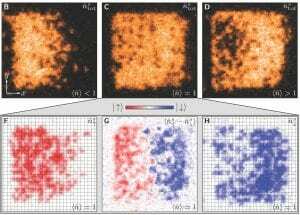 They were able to focus on the movement of atoms’ intrinsic magnetic field, or “spin,” across a few microns without disturbing their charge arrangement (charge is another intrinsic property of atoms) as the first of its kind with a quantum system. The results shed light on the mostly unexplored spin transport property of models condensed matter scientists use to describe the unusual behavior of solids at very low temperatures. Atoms are like small magnets, so applying a magnetic force pushes them around, here to the left (top left). Since these atoms repel each other, they cannot move if there are no empty sites (top middle). But the atomic “magnetic needles” are still free to move, with stronger magnets (red) diffusing to the left in the image, and weaker magnets (blue) having to make room and move to the right (bottom row). This so-called spin transport is resolved atom by atom in the cold atom quantum emulator. Khatami’s research aims to help scientists understand how superconductivity works—a finding that could potentially pave the way for a room-temperature superconductor, which would improve transportation and data storage and make homes more energy efficient by creating materials that allow better use of electricity. That is, as electricity goes through a device such as a phone or laptop, none of the electronic components would heat up. Superconductivity is the property of zero electrical resistance in some substances at very low temperatures (<-135 degrees Celsius). The experiment was carried out using 400 atoms cooled down to just a hair above absolute zero temperature (<-273 degrees Celsius). The atoms were manipulated to be two different types and to act as if they were electrons in a solid with two species of spin. The atoms were then trapped in a square box to see how they would respond when magnetic fields keeping one species on the left side and one species on the right side of the box were turned off. Scientists watched the process by using an electron gas microscope to measure the speed at which mixing takes place and deduce the “spin” current. Khatami compares the box of atoms to a shallow pool of water – if there was a divider in the middle with clear water on one side and water dyed black on the other side when the divider is suddenly removed the water would mix together and turn gray. The two shades of water would be similar to the two spin species in the quantum experiment, with the behavior of the atoms governed by quantum mechanics. To support the experiment, Khatami used more than 300,000 CPU hours on SJSU’s Spartan High-Performance Computer to solve the underlying theoretical model that was emulated in the experiment to support experimental observations. Khatami received the SJSU 2017-18 Early Career Investigator Award and has offered insights into his research on the web series Physics Girl. He was featured in the Fall/Winter 2018 edition of Washington Square alumni magazine.